Multi-morbidity is defined as the co-occurrence of two or more chronic medical conditions in one person. Long-term disorders are the main challenge facing health-care systems worldwide, but health systems are largely configured for individual diseases rather than multi-morbidity. A Scottish study by Barnett et al in 2012 (Barnett K, Mercer ST, Norbury M et al (2012) Epidemiology of multi-morbidity and implications for health care, research, and medical education: a cross-sectional study. The Lancet 380: 37-43) considered the distribution of multi-morbidity, and of comorbidity of physical and mental health disorders, in relation to age and socioeconomic deprivation. Existing approaches focusing on patients with only one disease dominate most medical education, clinical research, and hospital care, but increasingly need to be complemented by support for the work of generalists, mainly but not exclusively in primary care, providing continuity, coordination, and above all a personal approach for people with multi-morbidity. This approach is most needed in socioeconomically deprived areas, where multi-morbidity happens earlier, is more common, and more frequently includes physical–mental health comorbidity. The paper concluded that the most deprived areas experienced multi-morbidity 10 -15 years earlier. Table 9.12 presents estimates numbers and percentages of the population in Devon with certain number of long-term conditions. This highlights that over a third of the population are estimated to have one long-term condition (36.68%), around a seventh are likely to have two or more conditions (14.37%), and around one in 170 people are likely to have five or more long-term conditions. Figure 9.30 shows the pattern of people with different numbers of long-term conditions by age. 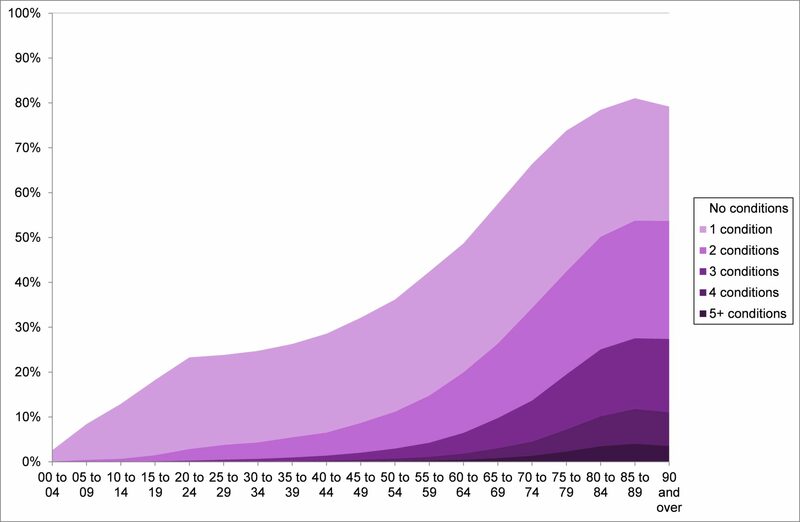 This reveals that with increasing age some individuals may have increasing comorbidities, which will impact on emergency admissions. The peak age for multi-morbidity is 85 to 89, which highlights that those surviving into their nineties and beyond are likely to have fewer long-term conditions. 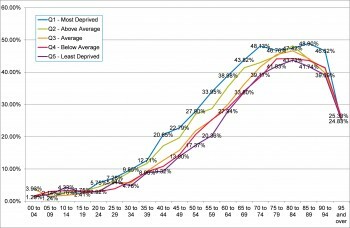 When deprivation is considered a different pattern emerges. Figures 9.31 and 9.32 display the percentage of the population with certain numbers of co-morbidities in the population in general and in those admitted to hospital in an emergency. Individuals living in the most deprived areas are typically around 10 to 15 years ahead in terms of the state of their health and this is even wider for certain age groups. 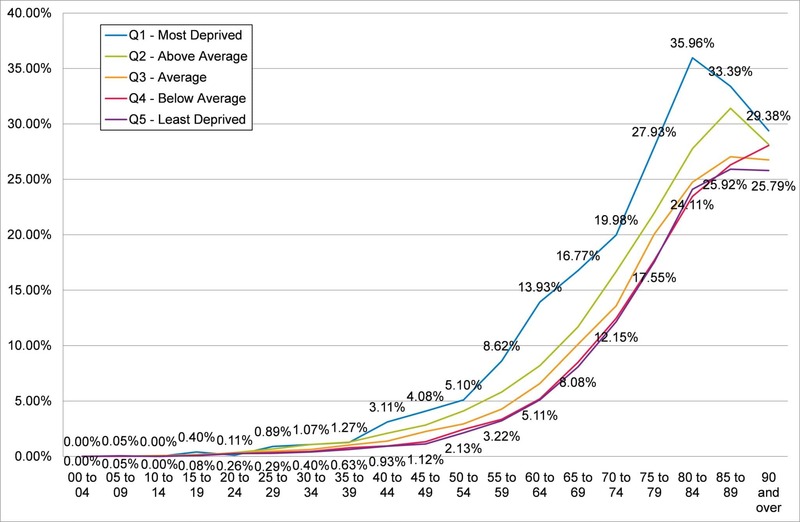 For example, for emergency admissions 20.65% had five or more comorbidities in the 40-44 age group in the most deprived areas, which is actually higher than the 20.36% for the 55-59 age group in the least deprived areas. Similarly for the general population 3.11% of 40-44 year olds in the most deprived areas had three or more long-term conditions compared to 3.22% of 55-59 years olds in the least deprived areas. Whilst the divergence also begins at age 20, the factors influencing it begin much earlier as described in chapter 8. When you look at 85 to 89, 90 to 94 and 95 and over, the percentage with five or more comorbidities actually drops. There are two possible reasons; firstly in a very elderly group some comorbidities may be ignored or overlooked as health professionals focus on the ‘clear and present danger’, secondly those surviving to a very old age may actually be likely to have less long-term conditions, it is probably a mix of the two. 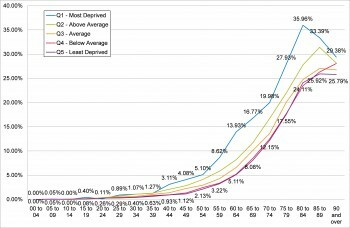 It is also interesting to note that differences between areas based on social deprivation start falling at after the age of 90 and do not exist after the age of 95. Figure 9.33 highlights the increased likelihood of having other long term conditions when someone has a selected long term condition. For each long term condition area the relative risk ratio indicates how many times more likely people are to have another long term condition compared to the reference group (those without the long term condition). It also highlights the relationship between physical and mental health, with the likelihood of serious mental illness (SMI) and depression also increasing when long-term conditions are present. So, for example, with Asthma you are almost four times more likely to have COPD than if you didn’t have asthma and 1.6 times more likely to have depression. 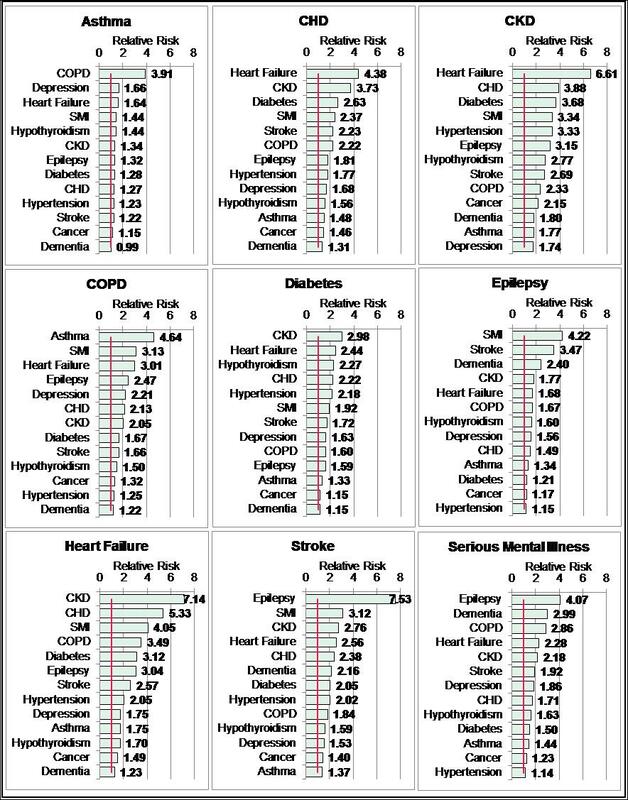 Whilst some of the co-morbidities illustrated here are unsurprising others are less well known or expected. Some clusters of multiple long term conditions are more likely than others. For example, someone with Heart Failure is seven times more likely to have chronic kidney disease, five times more likely to have CHD, and four times more likely to have a serious mental illness than someone who doesn’t have heart failure. 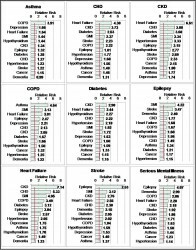 Equally someone with Chronic Kidney Disease is almost seven times more likely to have heart failure but also almost 4 times more likely to have CHD, over 3.5 times more likely to have diabetes and 3.3 times more likely to have a serious mental illness and hypertension compared to someone who does not have CKD. Someone with diabetes is almost three times more likely to have CKD, 2.4 times more likely to have heart failure and 2.3 times more likely to have hyperthyroidism than someone without diabetes.